Before Jackson, I had no idea what babies ate at different ages, or that there could be so many differing opinions on what/how to feed your baby. 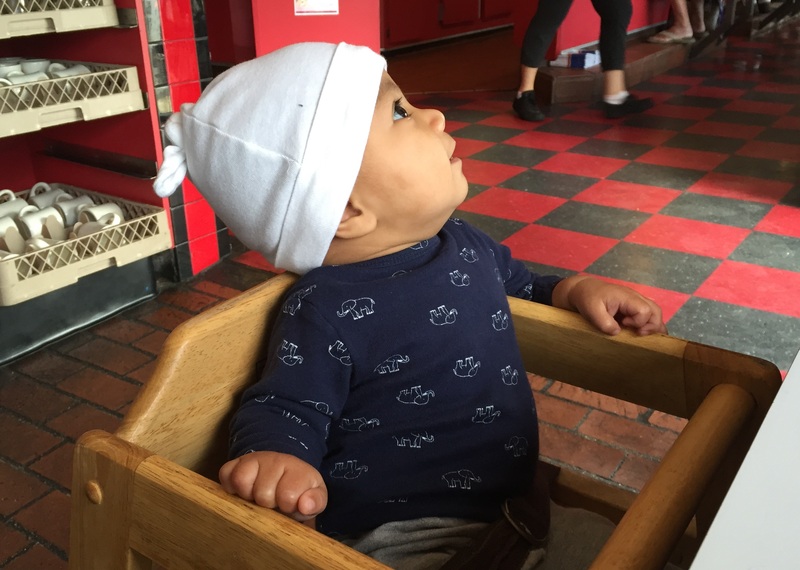 There is no one right answer, but here is a summary of how Jackson’s eating has evolved, and what has worked for our family and our little guy. 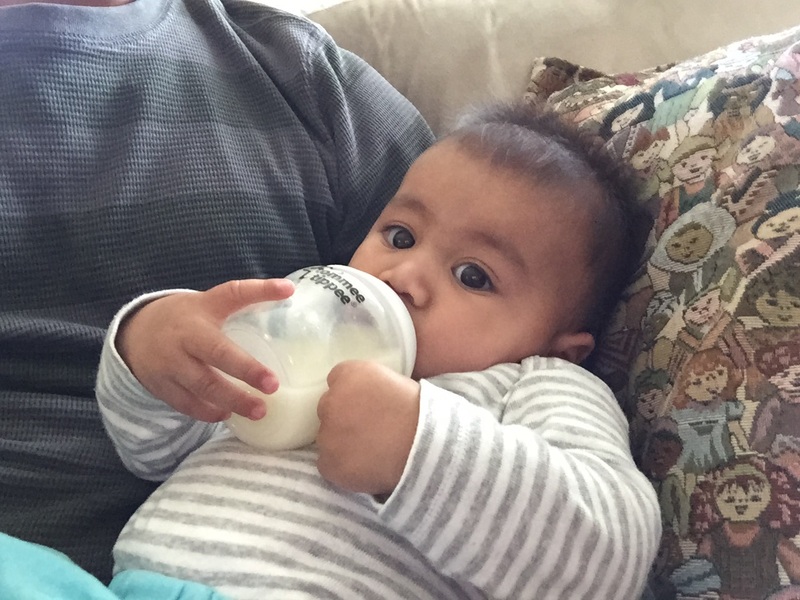 – Jackson was exclusively breastfed until about six months, when we introduced solids. Whenever we’re together, I nurse him, and when we’re apart, he has pumped breastmilk. I know that a lot of families like to pump an extra bottle so that the baby’s dad can feed the baby in the middle of the night and give mom a break, but I personally preferred a quick middle-of-the-night nursing session to extra pumping! – At six months, we introduced Jackson to solids. 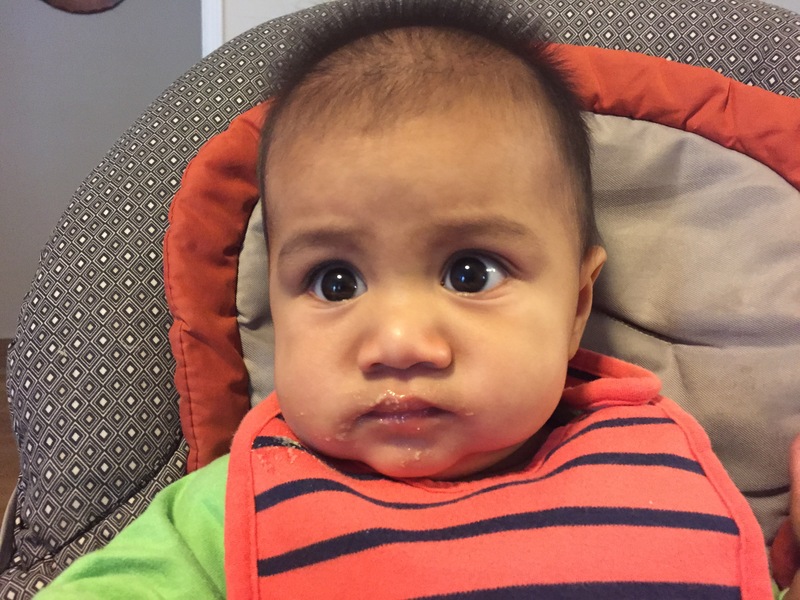 His first foods were baby oatmeal (initial fail) and pureed mango (win). For a while I toyed with the idea of baby-led weaning because I loved the idea of feeding him what we’re eating right away, but ultimately it was more practical for us to follow the traditional spoon-fed pureed baby foods route. – No matter what we feed him, Jackson looks disgusted after the first bite. He is shocked and appalled by all solid textures and tastes, apparently. When he opens his mouth for more, though, we know he likes it. – We have tried to introduce him to as many foods as possible early in his life. This is mostly because I want him to be able to eat table food, and the more ingredients he has been exposed to early on, the less we will have to worry when he is eating new foods with lots of different ingredients. – We feed him a combination of store-bought and homemade baby food. When I make a batch of baby puree, I freeze it in individual portions and then defrost a different flavor each morning as needed. The store-bought bags are convenient, and they are nice way to have him try a new food. I don’t want to spend the time and energy making a huge batch of something that he hates! I’ve found these silicon trays and tiny glass containers to be perfect for making and storing baby food. – He loves fruit, as I think most babies do, and likes most of the vegetables that he has tried. He is lucky that his grandpa is an expert fruit picker/purchaser, and introduced him to mangoes and papayas. He also loves bananas, apples, pears, green beans, carrots, and sweet potatoes. – He has tried pureed chicken, but is so far not a meat-lover. He tasted plain omelet for the first time over the weekend (the picture below was taken at a diner but the omelet was homemade), and he seemed to really like it. I’m not sure when he’ll be old enough to handle a a pork rib, but I’m sure his dad will give him a taste by next summer! – At 8 months old, Jackson typically has six to seven liquid meals a day (about 4 oz. each for those that come from a bottle) and two to three solid snacks. His snacks are getting quite large, though! He may eat anywhere from a couple of tablespoons to almost a cup of food. As someone who loves cooking and trying new foods, introducing Jackson to solids and new foods has been so much fun. The two of us eat breakfast together every morning, and he is just starting to sit at the table in his high chair and eat while we eat (“eat” = play with a frozen bagel or mash pancake chunks in his hands). I am super excited for him to be old enough to have favorite meals and to ask me for them! Carnitas, anyone?